"Vitana health biscuits with wheat molasses and beer fermentative. Brings strength, cures anemia and helps children grow. Available at fine pharmacies and Sazesh drugstore in Nasser Khosrow Street." 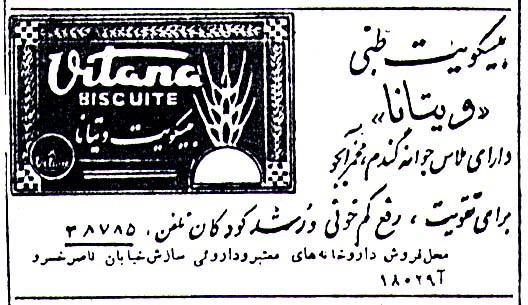 Published in Ettela'at, December 22, 1954.